15-05-2018 to 14-06-2018 through www.mppsc.nic.in or www.mponline.gov.in website. 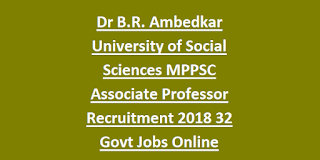 Candidates who are qualified PH.D in relevant subject and having minimum 8 years of teaching experience they are eligible for this MPPSC Assistant Professor Jobs. Candidates selection for this MPPSC Associate Professor Jobs will be based on their teaching experience, published books, and academic records. Detailed information for this Associate professor jobs of Dr B.R. 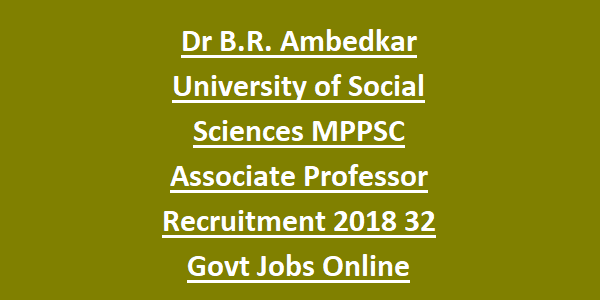 Ambedkar University of Social Sciences recruitment through MPPSC is given below. There are total 32 Associate Professor Jobs in this MPPSC Recruitment. For Subject wise vacancies refer official notification. Upper age limit for Associate Professor jobs is 65 years. Online portal fee for all candidates is Rs.150/- if you are paying through Kioski centers or if you are paying through online on your own then portal fee is Rs.100/-. Candidates who are qualified PG and Ph.D in relevant discipline they can apply online for these Associate Professor jobs. Candidates must have at least 8 years of teaching experience. Selection for these MPPSC Associate professor jobs will be based on candidates academic marks, work experience and the books they published. Candidates who are interested in this MPPSC recruitment they can apply online on or before 14-06-2018. Online applications only accepted through MPPSC official website or MP Online website from 15-05-2018.